A police officer surveys the scene. Six people were killed and at least 22 others were injured, including a 6-year-old girl, in weekend shootings in Chicago. The latest shooting took place around 10:35 a.m. in the 1500 block of south Kedzie Avenue. A 14-year-old boy was shot in the leg, police said. Details weren't immediately available Sunday. Around 4 a.m. Sunday when two people were shot in the 500 block of West Pearson Street. 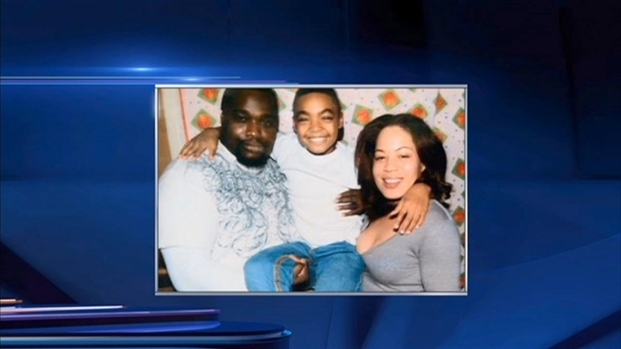 Marlon Young, 39, was gunned down by three people as he went out to get something from his car, his wife said. Anthony Ponce reports. A 23-year-old man suffered a gunshot wound to the leg and was taken in good condition to Northwestern Memorial Hospital, police said. Another man, 25, also shot in the incident, was later transported by someone to Northwestern Memorial Hospital where he was pronounced dead. Four people were shot at an Altgeld Gardens housing complex just before 2 a.m. in the 600 block of East 131st Street. 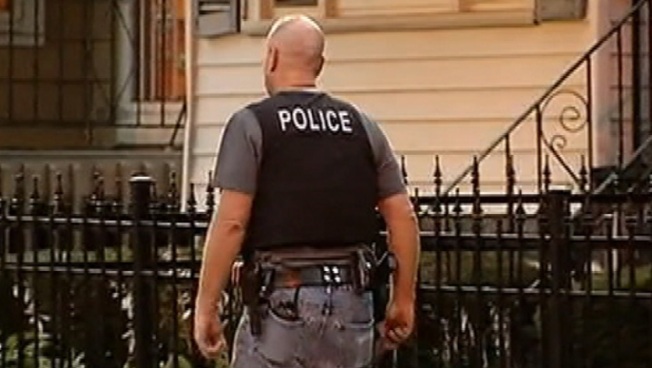 A new pilot program in Chicago has police knocking on the doors of would-be criminals, hoping to alert them of stiff penalties for gun crimes and warn them they are being watched. A 28-year-old man was pronounced dead at the scene and two others were taken to Advocate Christ Medical Center in serious condition, police said. A 22-year-old man also wounded in the shooting was dropped off at Metro South Medical Center in Blue Island in stable condition. Around 11:30 p.m. Saturday, a man was killed in a shooting at a Marathon gas station near 71st Street and Ashland Avenue. The 25-year-old man suffered several gunshot wounds to the body and transported in serious condition to Advocate Christ Medical Center, officials said. Eugene Clark, of the 7900 block of South Karlov Avenue, was later pronounced dead at Advocate Christ Medical Center, according to the Cook County Medical Examiner's office. A 25-year-old man was taken into custody after the shooting, according to Chicago Police News Affairs Officer Jose Estrada. Charges were pending as of Sunday morning. At the same time, a 17-year-old woman was shot in the 5000 block of South Dr. Martin Luther King Jr. Drive. The woman suffered a graze wound to the foot and was taken in stable condition to University of Chicago Hospital. Just before 11 p.m., a 24-year-old man was found shot in the head in the 8500 block of South Kingston Avenue. The man was taken in critical condition to John H. Stroger Hospital where he was later pronounced dead. No one is in custody in the shooting but the incident was declared a homicide, police said. Around 10:15 p.m., in the 8500 block of South Kingston Avenue, a 34-year-old man was shot in the leg and taken in stable condition to South Shore Hospital, police said. Hours earlier, three people were shot near 63rd Street and Troy Avenue. Three men suffered gunshot wounds to the leg after a group of offenders approached them on the sidewalk and began shooting, police said. All of the victims have known gang affiliations, Estrada said. A 36-year-old man as taken in good condition after the shooting to Little Company of Mary Hospital. A 22-year-old man was transported to Holy Cross Hospital in stable condition and a 23-year-old man was taken in good condition to Mount Sinai Hospital. Around 11:30 a.m. Saturday in the 5900 block of West Fulton Street, according to Chicago Police News Affairs Officer Jose Estrada. A 25-year-old man was shot in the stomach and leg and was transported in stable condition to Mount Sinai Hospital. Around 10:10 a.m. Saturday, a 17-year-old man was shot in the 7300 block of South May Street. The man suffered a wound to the leg and was taken to Holy Cross Hospital where his condition was stabilized, Estrada said. The teen has known gang affiliations, but police said it was not clear if the shooting was gang related. Earlier Saturday, a 27-year-old man was shot several times around 1:08a.m. in a drive-by shooting in the 5900 block of South Sangamon Street. The man was walking on the sidewalk when a dark-colored vehicle pulled up and a passenger opened fire, police said. The man suffered wounds to the stomach and leg and was taken to John H. Stroger Hospital in serious condition. On Friday, A 6-year-old girl was seriously wounded in a shooting in the Roseland neighborhood on the Far South Side. It happened at about 7:40 p.m. Friday in the 300 block of West 105th Street, according to Fire Media Affairs. The two victims were outside of a home when gunfire erupted. The girl was shot in the chest and was listed in critical condition at a local hospital. A 52-year-old woman was also shot in the leg and listed in serious but stable condition. The shooting reportedly stemmed from an altercation between two groups of men earlier in the day. No one was in custody for the shooting as of Saturday morning. Police are investigating. The weekend’s first fatality happened around 7:50 p.m. Friday when a 27-year-old man was shot while walking on the sidewalk. 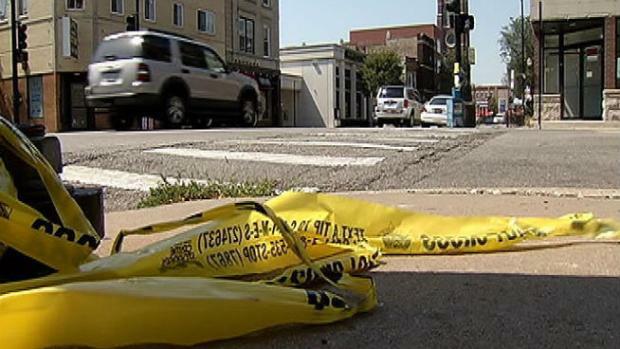 Police said a male offender approached the man in the 8100 block of South Vincennes Avenue and fired several shots, striking him in the head and stomach. The man, whose name has not been released by the Cook County Medical Examiner’s office, was pronounced dead at Advocate Christ Medical Center in Oak Lawn. Less than 10 minutes later, a 23-year-old man was shot while standing on his porch, police said. The man said he heard shots while standing on his porch in the 10100 block of South Union Avenue and discovered he was struck in the stomach. He was taken to Advocate Christ in stable condition. Police said no one is in custody for the shooting. Around 9:30 p.m., a 20-year-old man was injured in a drive-by shooting in the 3800 block of West Hirsch Street. Police said a light-colored sedan drove by and fired several shots. The man was pronounced dead at Mount Sinai Hospital, officials said. Another drive-by shortly after wounded a 23-year-old man. The man was shot around 11 p.m. in the 7800 block of South Ellis Avenue while standing on a porch with a group of people. He was struck in both legs and transported to Advocate Christ in stable condition.